Michigan Tech’s business students are stepping it up. This year two members of Michigan Tech’s American Marketing Association (AMA) chapter, Mairi Smith-Risk (President) and Tracy Payne, attended the 30th Annual International Collegiate American Marketing Association conference and walked away with two international awards. Smith-Risk entered Michigan Tech’s chapter into multiple competitions including International Collegiate Chapter of the Year, Most Outstanding New Chapter of the Year, Outstanding Efforts in Fundraising and Professional Development, and the Case Competition. They competed with over 120 chapters and thousands of students from around the world. 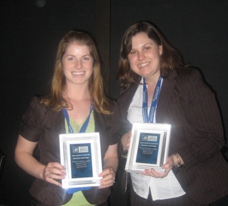 Michigan Tech’s AMA chapter was awarded Outstanding Efforts in Fundraising and Most Outstanding New Chapter of the Year. Michigan Tech was awarded the Most Outstanding New Chapter due to the many professional development projects and activities they participated in. During the past academic year, Michigan Tech’s AMA chapter wrote a marketing plan for Challenge X, which they were awarded money for, competed in a case competition and wrote a marketing plan for McGraw Hill, developed marketing publications for the American Motorsports Team, created a promotional plan for the Library Restaurant, completed research for the Leadership Acceleration Team, and created a trade show booth and marketing publications for SAE enterprises. Many members attended a plant trip to Chicago in conjunction with Phi Beta Lambda. While in Chicago they toured an advertising agency, a financial firm, the Chicago Bulls and Blackhawks stadium, and the Chicago Board of Options. Members also attended a regional AMA conference in Illinois, worked on five fundraisers this year and increased membership by nearly 200 percent. The trip to New Orleans for the International Collegiate American Marketing Association conference was sponsored by the Office of Student Life and the Parent’s Fund of the Michigan Tech Fund, the School of Business and Economics Dean’s Fund, Michigan Tech’s AMA chapter, the Undergraduate Student Government, Mairi Smith-Risk, and Tracy Payne. If you would like to be involved in Michigan Tech’s AMA chapter, contact Mairi Smith-Risk at mnsmith@mtu.edu. IBM (NYSE: IBM) and Michigan Technological University today announced several initiatives to help students develop the multi-disciplinary skills required in a growing number of jobs and professions around the world. Businesses today are looking to the next generation of IT and business experts for so-called “T-shaped” skills, which encompass both deep business skills, represented by the horizontal line of the “T,” and technical understanding, represented by the vertical line. Top prospects will understand the dynamics of the globally integrated enterprise, can work across geographically distributed teams, and have experience using open source technologies to address real world business challenges. IBM is teaming with Michigan Tech to develop curricula and sponsor an ‘on the job’ learning program to encourage the development of these sought after skills. In an effort to encourage the use of open source technologies, IBM has donated WebSphere software with the agreement that any assets created through these programs will be made available to other universities around the world at no charge. Michigan Tech recently introduced a Service Systems Engineering program to address the expansion of the services sector, which the U.S. Bureau of Labor Statistics reports represents more than 80 percent of the U.S. economy and is continuing to grow. ver the past five years, IBM has been working with more than 150 universities around the world to grow the adoption of Services Science, Management and Engineering (SSME) http://www.ibm.com/university/ssme which is similar to Michigan Tech’s program. Taking a multi-disciplinary approach to education, SSME looks at how factors such as technology, relationship, culture, economics, and processes inform and impact the service business. Moving beyond the classroom, IBM and Michigan Tech want to give students a chance to apply their academic expertise and problem solving skills to real world business challenges. Unlike an internship or a cooperative work experience, Michigan Tech’s Enterprise program http://www.enterprise.mtu.edu brings together a small group of students that study different disciplines in a start-up business environment — the students are compensated for their work and they pay rent and other overhead costs. IT Oxygen http://www.itoxygen.com, partially sponsored by IBM, is a student-run team focused on using cross-disciplinary expertise to solve some of the most challenging business process issues facing the university. By working in a team that spans academic disciplines, the students get natural exposure to new ways of thinking and problem solving. IT Oxygen is getting hands-on training by developing solutions to improve Michigan Tech’s course scheduling tools with regard to classroom, student, and professor availability. Using WebSphere software, the students can model and simulate how the processes can be transformed before they actually go in and do the work. The team is also using business process management (BPM) enabled by SOA to streamline many processes associated with submitting a grant research proposal. IT Oxygen creates open source solutions to address all of these challenges, making them available for reuse by other universities. Much of this is made possible through IBM’s Academic Initiative, a program offering a wide range of technology education benefits to meet the goals of colleges and universities. As a member of this initiative, participating schools receive free access to IBM software, discounted hardware, course materials, training and curriculum development. Nearly 2,000 universities and 11,000 faculty members worldwide have joined IBM’s Academic Initiative. Michigan Tech is also part of the World Community Grid http://www.worldcommunitygrid.org/newsletter/video/viewVideo.do which is focused on creating the world’s largest public computing grid to tackle projects that benefit humanity. 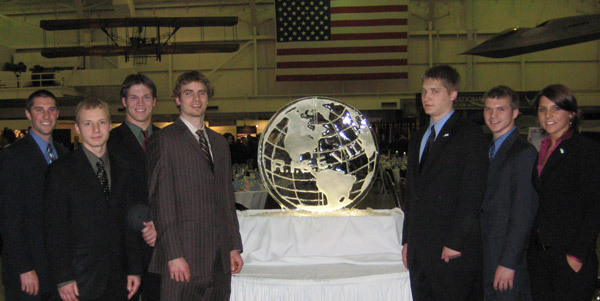 On Thursday, April 17, 2008, CenTILE sponsored the first Elevator Pitch Competition on the Michigan Technological University campus. Ten student teams competed for $1,750 in prize money. The video below is the first place team of Kyle Marsh, a recently graduated Mechanical Engineering student and Lauralee Kroll a junior Business major. Their Elevator Pitch dealt with the CPR Mattress which is currently being developed by a group of students called Tech Initiatives. Both Kyle and Lauralee are members of this student run company. 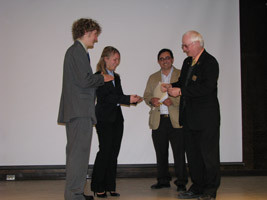 For additional videos and photos of the competition go to http://www.centile.mtu.edu/elevator_pitch.html. 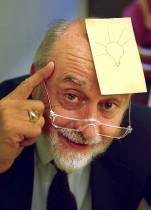 Inventor of the Post-it® Note, Art Fry, will be on campus Friday, April 18, at 10 a.m. in Fisher 139, to talk about the innovation process. Fry is a retired 3M Corporate Scientist and will be a CenTILE Executive-in-Residence. His visit coincides with the Extreme Entrepreneurship Tour. For more information about Fry, see http://www.3m.com/us/office/postit/pastpresent/history_pl.html. APMP: 2008 Back-to-Back National Champs!!! The Michigan Tech Applied Portfolio Management Program (APMP) team returns from Dayton with its third first place finish. They were crowned Back-To-Back National Champions at the Eighth Annual RISE (Redefining Investment Strategy Education) Conference, the largest student investment conference in North America. The APMP won the “value” category with the highest risk-adjusted return for 2007 in the undergraduate division at the national investment competition. Over 2300 participants, 267 universities and 69 countries were represented at this year’s competition. RISE is a student investment strategy symposium hosted by the University of Dayton. Modeled after the World Economic Forum, RISE connects investment students and faculty with Wall Street professionals in interactive discussions. Representing the School of Business and Economics were Joel Pergolski, Brad Harry, Tony Hellenbrand, Mark Malekoff, Korey Capello, Lorn Randell, Kayla McCormick, and Kartikeya Srivastava. Associate Professor Dean Johnson is the Founding Director of the APMP. At the formal dinner announcing them as the winner, the presenter commented “You have to respect Michigan Tech – 3 for 8!” Two of the students were selected to be on stage for the first ever remote Nasdaq Stock Market closing as well.